It’s no secret that face shape drastically impacts what hairstyles look best. If your face is on the rounder or plumper side, have no fear! We have rounded up 20 flattering looks for you to help you put your best foot forward. From long girly locks to short edgy cuts, you can find the perfect look to suit your personal style! Buns are a versatile updo option because they can be regal and elegant or messy and tousled. A bulky bun like this is a great choice for chubby faces because the big silhouette makes your face look smaller in comparison. Try this bun for yourself by wrapping your ponytail tightly around into a spiral that you fasten with bobby pins and plenty of hairspray! Perfect for a night out, this loose updo is chic without trying too hard. The key is to leave two loose strands that will fall gently around your face; these will have a slimming effect. To get the volume at the top use mousse on your wet roots! 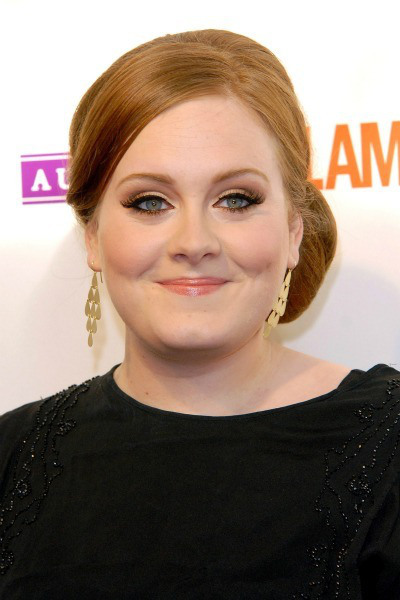 Adele’s subtle bouffant hairstyle adds an elongating touch without being over the top. Get the look for yourself by combing your bangs to the side, slicking them with hairspray and pinning them behind your ear. Added bonus: this style is deliciously retro! 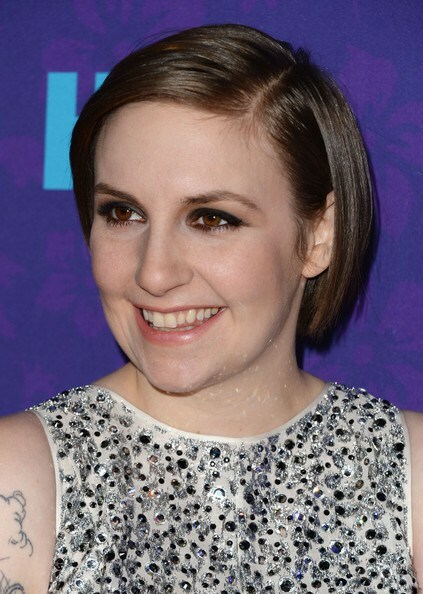 Lena Dunham’s short and simple bob allows her facial features to take the stage! 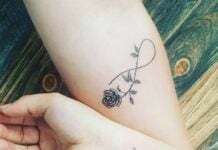 Her deep side part also has a great slimming effect. When getting this cut ask for a straight bob that hits right at the start of your jawline. 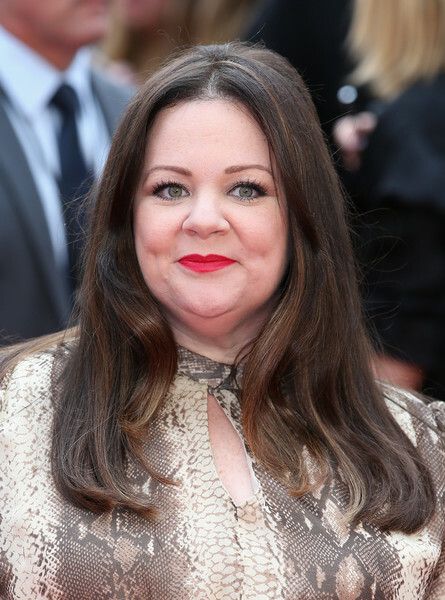 Middle parts are all the rage this season and we love Melissa Mccarthy’s rendition of it with her straight chestnut locks. The hair sweeps just below her shoulders which add a nice elongating effect to her face and neck. For added slimming properties try gently curling the front strands of your hair so that they frame your face. Mariah owns her curves and so should you! Emulate her diva glam with these loose beach waves and add some highlights to get that shiny gleam. 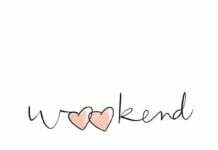 A center part means that your hair will have equal amounts of volume on both sides, which will make your face look small and cute! A line bobs look great on round faces because they add an angled element. Amplify this effect by opting for a deep side part and teasing your roots. The volume on the top will make your face look smaller, in conjunction with the angled ends that elongate your face. Kelly Osbourne looks phenomenal (as usual) with this flat ironed bob and blunt bangs! 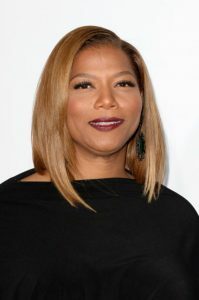 Her bob hits an inch or so below her chin which has a slimming effect by stretching out the face, and her blunt bangs make a bold statement. Channel your inner Renaissance princess with this beautiful side braid. This look is especially great with naturally curly or wavy hair, as it will add a naturally tousled spontaneity. Gently scrunch your hair before braiding to add texture, and pull your braids slightly apart after braiding to achieve this delicate style. America Ferrera stuns with with this pompadour and side ponytail combination. The high side ponytail is flirty and the voluminous pompadour is glamourous and feminine. Accessorize with some dangly earrings to increase the slimming effect! Style icon Mindy Kaling shows off the perfect ombre look! This ombre style draws attention downward, elongating the face. For added flair, try out long side bangs that brush your face. Add some subtle curls for a look that is red carpet ready! Channel Khloe Kardashian by asking for lots of choppy layers next time you go in for a cut. Layers add depth and definition to your round features! If you have thick hair, layers have the added benefit of making your hair tamer and easier to manage. 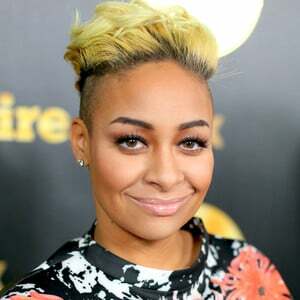 Shake it up with some eye catching color like the bleach blond cut that Raven-Symoné is sporting. Her shaved sides and big top are perfect for her round face as they add edge and volume. Your attention is drawn up with her hair and this stretches out her face. Never one to shy from head turning choices, Nicki Minaj looks stunning with platinum baby doll ringlets. You can try this look for yourself with a curly lace wig or by using a thin curling iron, a teasing comb and volume-inducing hairspray! If you want a do that requires low maintenance, opt for a short pixie cut. Tousled volume on the top and side bangs in the front help draw out your facial features, creating a more defined look. Finish off the look with bold eyebrows and contoured cheeks. Channel the old school glamour of the 50s with this curly bob. Curl the bottom part of your hair with a 1 inch iron, and use a flat iron for the top part of your hair. Make a deep side part and tease the roots of your bangs to get the full sweeping look. Pulling the top half of your hair back can add nice dimension to your cheekbones. Tease the roots of your hair on the top to add volume and seal it in with some hair spray. You can gently scrunch your hair for a naturally tousled effect. Bangs parted down the center have a slimming effect because they narrow the top half of the face. Couple this bang look with shoulder skimming locks or a lob for the best results. 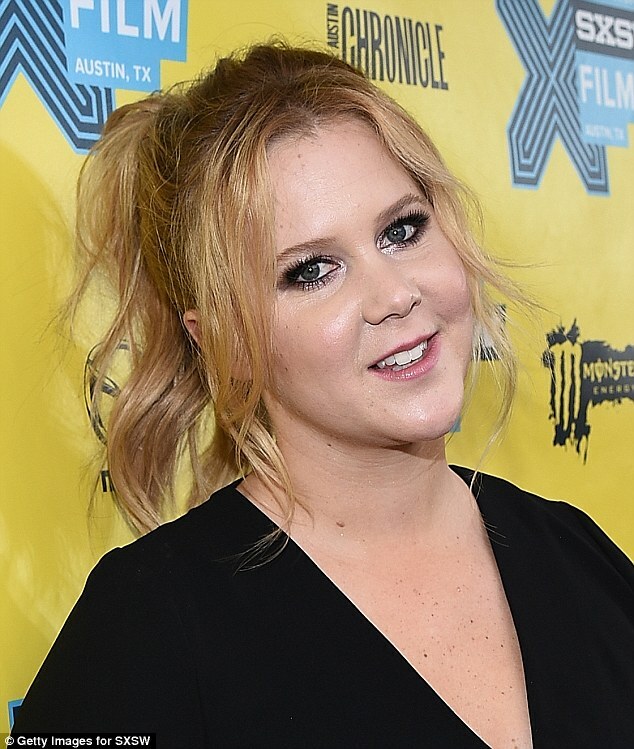 We love how this look shows off Jenna’s apple cheeks! High ponytails are flirty, feminine and fun. Keep the front tendrils of your hair loose so that they frame your face for a slim look. If you have naturally curly hair you can easily achieve this intentionally messy style with some hair spray and scrunching. 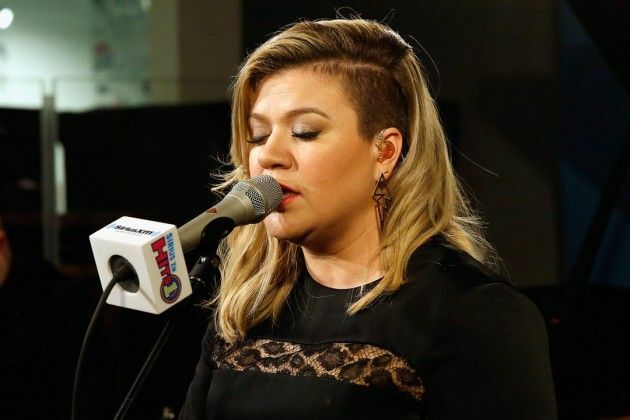 Kelly Clarkson shows off a new side with these trendy undercut hairstyle. The undercut looks great on rounder faces because it makes asymmetry easy. The added volume on the other side helps to slim down the face and as an added bonus you look badass! We hope you’ve enjoyed our top list of hairstyles for chubby faces and found a new look to try out!